Some Zavio IP cameras have digital input and digital output ports (DIDO). On this page, you can find all of the Zavio camera models with DIDO. Zavio cameras also have an SDK / API in which developers can integrate 3rd party applications. One of the API methods provided by Zavio allows you to turn the digital output port of the camera on and off. So, we used this method to create three new controls in the our iCamViewer app: On, Off, and Pulse (on, then off). You can see the digital out controls in the app below. The iCamViewer app can be downloaded here for free: iOS download and Android download. 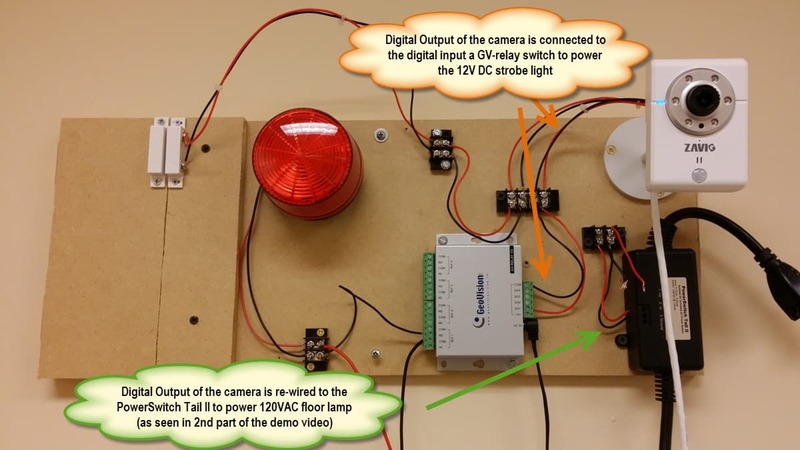 This is how the digital output of the Zavio F3210 IP camera was wired to a GV-Relay switch to control a 12V DC strobe light. To test a 120VAC light, I used a PowerSwitch Tail II. In the below demo video, you will see that I re-wired the digital output connection from the camera from the GV-Relay to the PowerSwitch Tail II. 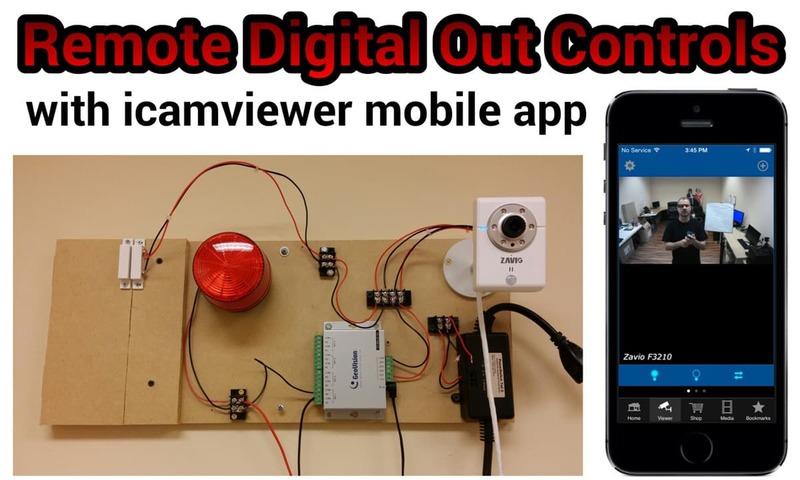 Watch this video to see a demonstration of a 12V DC strobe light and a 120VAC floor light turned on and off using the iCamViewer app. This can be done on the local area network where the IP camera is located or remotely over the Intermet (as long as you setup port forwarding on your router). If you are interested in learning more or want to set this project up your self. You can find step-by-step setup instructions here. If you have any questions about this article or anything related, please email me direct at mike@cctvcamerapros.net.